NH Research, Inc. designs and manufactures power electronics test systems and instruments as well as complete turn-key test systems. Its products are used worldwide by manufacturers in the switching DC power supply, UPS, battery and battery charger industries. Applications typically involve either characterization or final test of customer products where a combination of advanced measurements, rapid test times and ease of setup and use are important. View our product comparison tables for Battery Test/Battery Emulation Testing, AC & DC Electronic Loads, AC & DC Sources, or AC & DC Regenerative for more details. This type of test system consists of a complete test solution for electrified vehicle batteries that require power cycling or simulated drive cycle profiles to determine long term performance. View product comparison table. This power instrumentation for customer-built test systems consists of programmable AC & DC sources and loads for use in a customer designed & built test systems. View product comparison table. 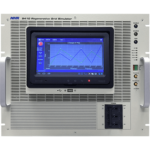 Theses AC & DC regenerative load products are designed to assist companies in performing testing while simultaneously improving utility-energy efficiency and reducing operating costs. The regenerative feature results in a dramatic reduction in the net utility consumption and reduction in utility-demand charges. View product comparison table. These software suites incorporates all the necessary features for you to take full advantage of NH Research, Inc.’s power electronics test systems and instruments, while substantially speeding up your test process. This Product Selector Guide will assist you in selecting the appropriate AC or DC Electronic Load for your application.